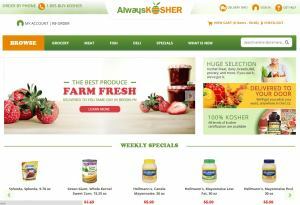 Always Kosher is the online grocer of Mountain Fruits, a well-known and long-established supermarket in Brooklyn, N.Y. – the kosher food capital of the country. They deliver farm fresh fruits, vegetables, meat fish and all kind of kosher groceries at your door step. Their website consists of thousands of products that are updated on daily basis using feed system. The weekly and daily specials section is maintained using administration back end. This ecommerce website design has many custom changes.